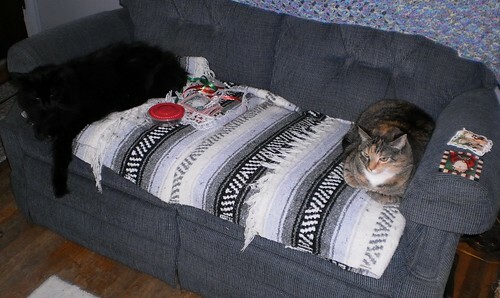 Deb's Cup of Tea: Where Am I Supposed to Sit? I got up to wash a load of dishes and Mija took my space. They actually let me sit there between them so long as I gave equal ear scratches. Eventually, Mija jumped down and went to find some sunshine to lie in. Iowa lost and I got the trims all sewn on the ornaments. Tomorrow, I can pin the fronts to the backs. They might let me sit in the middle again.